"When I took him to the doctor his scalp looked scary, now he has recovered and is so happy." When Rita and Sandeep had Gaurav six months back the condition of their family was bad. Gaurav’s elder sister was down with a bout of viral fever. Being daily wage earners it became very difficult for them to bear so much expenses. When I took him to the doctor his scalp looked scary, now he has recovered and is so happy. When Rita and Sandeep had Gaurav six months back the condition of their family was bad. Gaurav’s elder sister was down with a bout of viral fever. Being daily wage earners it became very difficult for them to bear so much expenses. Even though Gaurav was born in a government hospital, his parents took him back home against the advice of the doctors because his sister also had to be looked after. Soon after the baby’s scalp started to turn red and flakes began to appear on his scalp. Initially the mother did not notice but when the flakes turned heavy she began to go to a local doctor to cure her baby but he could not do much. 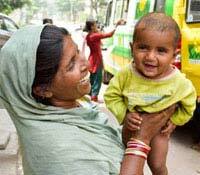 After hearing about the Smile on Wheels, Rita took her baby to the clinic where he was prescribed an ointment. Gaurav began to recover in no time and his parents are overjoyed that he is growing up healthy and happy. "Our children always complained that we did not do enough for them and then they left us in our old age." Mahesh and his wife have five daughters. They raised them with equal love and never did they regret not having a son. His children grew up, got married and moved to different places. Our children always complained that we did not do enough for them and then they left us in our old age. Mahesh and his wife have five daughters. They raised them with equal love and never did they regret not having a son. His children grew up, got married and moved to different places. They began blaming their parents for not providing enough for them and slowly over time stopped coming to see them altogether. Both Mahesh and his wife began to suffer from old age related problems and even when their mother was on her death bed none of the children came. Mahesh’s health too started to suffer after the demise of his wife and with no one to care for him he became weaker. It was during one of the community counseling sessions that Mahesh came to know about Smile on Wheels clinic and began to attend it regularly. His health has improved and he also talks to the volunteers and jokes around with them. He tries to keep happy and healthy like the doctor asked him to. 82 year old Savitha lives with her husband in a tin shanty in the middle of a congested and unhygienic Chennai slum. We are old and poor. Our health is failing. We only find relief in each other. 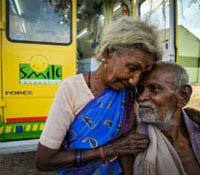 82 year old Savitha lives with her husband in a tin shanty in the middle of a congested and unhygienic Chennai slum. When their children refused to take care of them they had no option but to suffer silently. There was no one who could provide them warmth. Her husband is slowly losing his eye sight and both husband and wife are suffering from many other health problems due to their age. The families in slums like these do not have time to care for diseases or even if they do they do not have a choice because they have to earn their daily bread and look after their families. Most people in these slums suffer in silence, often losing their lives to curable diseases. It was through her friends that Mission Education Program of Smile Foundation came to know about Purnima and her brothers. After much discussions and talks with her grandparents Purnima was finally admitted at the centre. She currently studies in class 6, her brother Shubh is in class 3 and another of her brother Som will come to class 1. Very soon their hard work and dreams are going to bear fruit and they are going to be successful. 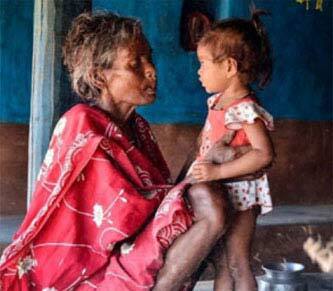 When a lot of children and adults began to fall sick at regular intervals the tribal community at Kalahandi, Odisha the people did not know who to turn to. Their regular visits to the local quacks increased but they could hardly provide any relief to the people. 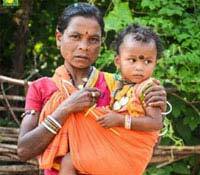 When a lot of children and adults began to fall sick at regular intervals the tribal community at Kalahandi, Odisha the people did not know who to turn to. Their regular visits to the local quacks increased but they could hardly provide any relief to the people. The residents of the area work as daily wage laborers and either cannot afford to go to a doctor or do not want to go to the doctor and lose a day’s wage. These kinds of health problems have been a common problem in the area because of unhygienic lifestyles and continuous neglect of minor health problems. When the Smile on Wheels services started in the area it bought relief to 42 of the remotest of villages in Kalahandi. Launched in June 2015, the project has already benefitted a population of over 20,000 people. Various sensitization programs to spread awareness about health related issues are conducted regularly. Volunteers and ground staff pay door to door visits to create awareness about the benefits of availing a qualified doctor’s advice in case of an ailment. "I am recovering slowly, thanks to the doctor who cured me." When asthma and skin problem worsened, 65 year old Hajrath Barar had to discontinue his work in the nearby farms as a daily wager. 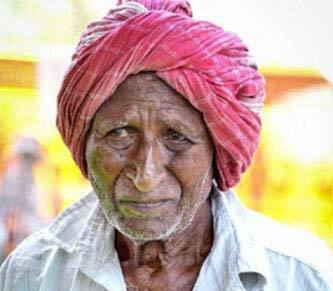 When asthma and skin problem worsened, 65 year old Hajrath Barar had to discontinue his work in the nearby farms as a daily wager. Hajrath was bound to stay at home, causing his wife to work in the fields to fulfill the basic household needs. Due to lack of access to medical facilities in the village, the residents had to travel around 12 km to reach the nearest Community Health Centre (CHC) in Chanderi when they suffered health problems. People like Hajrath avoided this, because they could not afford to lose a day’s wage. Hajrath’s problems were identified by Dr. R K Sharma, who heads the project team of Smile on Wheels clinic in Ashok Nagar. Under his prescription, effective tablets and ointments were provided to him, and after 15 days Hajrath’s health started improving. Hajrath Barar has now recommenced his work in the farms. He continues to take his medicines for asthma and also takes part in mobilising other villagers in seeking healthcare from the Smile on Wheels. I raised my son alone. 12 years ago, Ravi got married and his wife did not want to live with me. They left me alone and went to the city. Savitri faced a lot of hardships while raising her son alone after the death of her husband but she worked on daily wage and in the fields and did not let her son face any hardships. 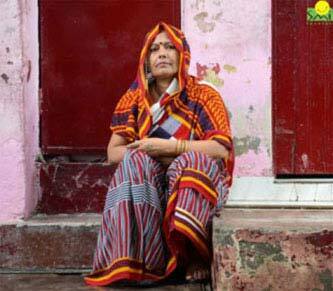 Her son grew up and got married and migrated to the city in search for a better livelihood. They left Savitri alone and when she fell sick she had no one to look after her and the doctor was miles away. 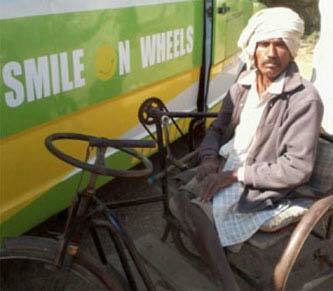 When the Smile on wheels started services in the area Savitri found much needed relief. She was visited by the doctors at home and necessary medicines were prescribed. The community volunteers keep a check on her health regularly and the regular visit of the Smile on Wheels mobile hospital has ensured that Savitri remains healthy. She still misses her son but is now healthy and happy. 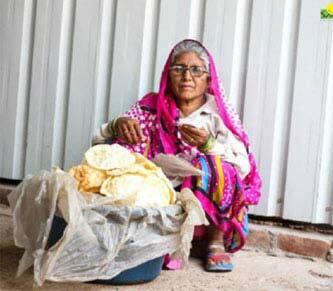 Krishna Devi sells papad on the roadside. She earns 100-150 per day which is sufficient for her to feed herself and sometimes buy sweets for her grandchildren. Krishna’s wrinkled face and toothless smile does not give away her pain that she has to go through every day; her children refused to support her anymore and asked her to earn and live on her own. She also faces health issues related to old age. When the Smile on Wheels volunteer came to know about Krishna she immediately visited her and told her about the regular visits of the Smile on wheels mobile hospital and the services provided. 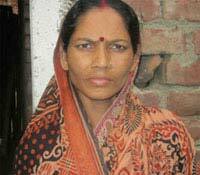 Krishna Devi was overjoyed because now she could avail healthcare at her door step and avoid losing a day’s earning. Krishna Devi’s health care is now being taken care of by team Smile ion Wheels along with many like her. Namita’s daughter was the joy of her life but she was weak and malnourished, her survival became a struggle, until Smile on Wheels came to her rescue. After years of praying, I became a mother. My happiness was unlimited. She was tiny, pretty, and vulnerable. But my happiness turned into pain when the nurses said she was severely underweight and malnourished; and might not survive longer. I kept looking at my child as she kept crying. I started crying with her until about 12 hours later when I saw her smile for the first time. She had dimples. That's when my heart melted. That's when I promised myself that I would never give up on her. was assisted by the workers from Smile on Wheels mobile hospital to take care of Mamta, they assisted Namita in eating healthy to prevent the breast feeding baby from growing up under nourished etc. Mamta is now growing up to become a healthy child. "We lost all our hard earned money in fighting Dengue last year. Three of my family members – my husband, daughter-in-law and grandson"
The three members Vrinda Devi lost to dengue was due to the filth that surrounded them in the resettlement area they live. The three members Vrinda Devi lost to dengue was due to the filth that surrounded them in the resettlement area they live. With a limited income that makes it difficult to arrange for a two-square meal, there was no one whom the family could ask for money to get treated. 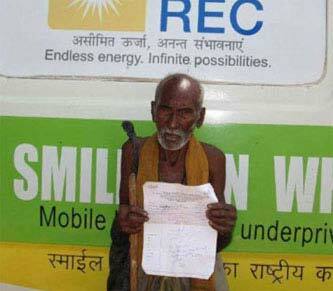 Hope came in the form of the Smile on Wheels who upon knowing the plight of Vrinda Devi visited them the same day. Their doctors not only cured the family members but also provided with all the blood tests and medicines for free. Their volunteers shared some simple tips with the community as well to get rid of the filth so that they could stay away from such diseases. Sobha Devi lives with her two sons in Mithaj village, Madhepura, Bihar. Her husband migrated to Kerala in search of work six years ago and sends whatever little he earns home every month. 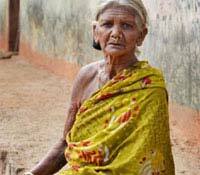 Sobha works as a daily wager in nearby fields. After some time Sobha started suffering from severe pain in her breast. At first she ignored it. Going to the hospital would cost money and loss of a day's wages. The temporary relief provided by pain killers helped her carry on, but her ailment became worse, inching towards a point of no return. Smile on Wheels began operations in her village in this hour of dire need. The doctor's checkup revealed a lump in her breast and medication was immediately prescribed. In three months the lump disappeared and so did the pain. Unwilling to take any chances, the SoW team referred Sobha to the Government hospital to check for malignancy which thankfully came negative. A 10 year old jovial and ambitious Thanuja was made to drop out of school by her parents. But this young girl fought to achieve what was rightfully hers. Forty-five years old Nemabhai Makwana from Shinad village in Patan district, Gujarat, has been living with polio since birth. Because of his disability, he is completely dependent on his parents. Nemabhai's aging father, a small-time farmer, is the sole provider of the family. Life is not easy when one has to deal with both disability and poverty. A minor ailment seems like a big battle. The nearest government hospital is a journey across seven seas, literally. Smile on Wheels came as a hope at the doorstep of people like Nemabhai, when it was introduced in 20 villages in Patan, with support from Cairn India. 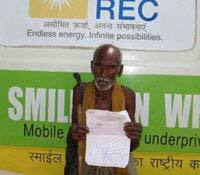 Nemabhai had been going through severe chest pain for quite some time, when Smile on Wheels came to his aid. After the diagnosis, treatment began immediately and follow-ups were conducted twice a week. After two months, Nemabhai is now as full of life as he has been known for. 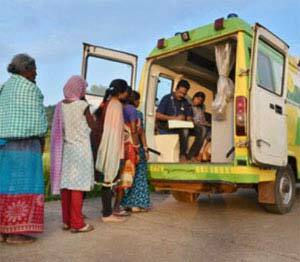 As if he has conquered immobility, Nemabhai now mobilizes villagers and brings them to Smile on Wheels every week when the mobile hospital pays the routine visit to his village. Jamuna and her granddaughter Nilima are happy and healthy now. Thanks to Smile on wheels and their timely check-ups. I have passed seventy years of my age without any wish, but now I have one – to be alive for some more years to continue fighting for my granddaughter, Nilima’s happiness. All I have today in my world is her. To me, she is nothing less than a beautiful and lovely doll bringing a lot of happiness in my life. Nilima’s parents are no more. Although her childhood isn’t about balloons or toys, it isn’t about suffering either. There were days when I stayed hungry, but never kept Nilima empty stomach. I never let her stay off my eyes. That’s why I bring her with me to my workplace where I get daily wages because if I leave her at home there will be no one to look after her. Jamuna’s and Nilima’s health is being taken care of by the Smile on wheels mobile hospital clinic. Timely check-ups, counseling on proper diets and awareness about curable diseases helps Jamuna and Nilima be healthy.